When the railways started, the Post Office had a legal monopoly on the delivery of letters. This meant (at least in theory) that you could not post a letter by train. However, people found a dubious way round this restriction. The Post Office did not have a parcel delivery service, and when the railways introduced such a service, people found a way to use the parcel delivery services to fraudulently deliver letters by train. By tying a piece of string around the letter they claimed that it was a ‘parcel’, and therefore not subject to the Post Office monopoly. Of course, the Post Office was not happy about this practice, and tried strenuously to stamp it out – unsuccessfully! The letter illustrated above (dated 16 March 1864, and addressed to a Solicitor in Appleby) was sent by road from the hamlet of Newby to Cliburn Station, then taken by train to Appleby. 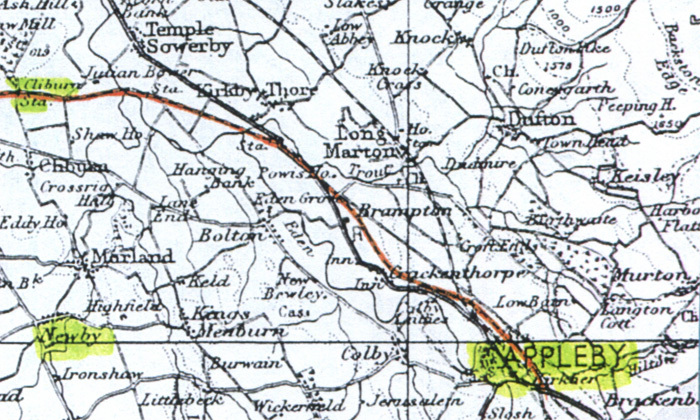 As you can see from the map below, the distance the letter had to travel to get to Cliburn Station was about half the direct distance between Newby and Appleby! After failing to stop the practice of String Letters, the Post Office eventually came to an agreement wherby the railways could sign a legal agreement to provide letter delivery services, but only on terms approved by the Post office. This agreement came into force on 1 February 1891. Any railway company signing up to the agreement agreed to accept and convey by the next available train or steam ship “SINGLE INLAND LETTERS NOT EXCEEDING ONE OUNCE IN WEIGHT, either to be called for at the station of address, or to be transferred there to the nearest letter box”. All such letters had to have a normal Post Office stamp on them, plus a railway company stamp of “NOT LESS than twice the postage rate”. At the time, the standard Post Office charge for letter delivery was 1d, so railway letters had to have a 1d Post Office stamp plus a 2d railway company stamp. The Post Office would not allow the railway company stamps to contain the word Postage, and also stipulated that railway company stamps had to conform with a standard design laid down by the Post office (which didn’t always happen!). Here is an example of an early railway letter which was brought to Braunton Station (in Devon) on 17 September 1893, put on the Lomdon & Exeter T.P.O. (probably at Exeter), then carried via Didcot to Winchester, where it would be posted into the nearest letter box for final delivery by the Postal Service. The Post Office did not allow railway letter stamps to contain the word STAMP – which might seem rather petty today, but was a major issue at the time. As you can see, the London & South Western Railway stamp contains only the wording FEE FOR CONVEYANCE OF SINGLE POST LETTERS BY RAILWAY. The above stamp also conforms with the standard design laid down by the Post Office – such stamps had to be green, with the overall design and size more or less the same as the above illustration (only the company name varied from one railway to another). The cost of railway letters fixed in 1891 (a 1d Post Office stamp plus a 2d railway company stamp) remained constant until 1918. 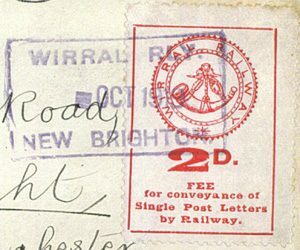 On 3 June 1918, the Post Office Inland Rate was increased to 1½d, but for a short while the corresponding price of railway company letter stamps stayed at 2d. It wasn’t until 15 January 1920 that the price of railway company letter stamps was increased to 3d. Here (below) we show a railway letter posted in the period between 1918 and 1920 when the letter prices were ‘out of kilter’. 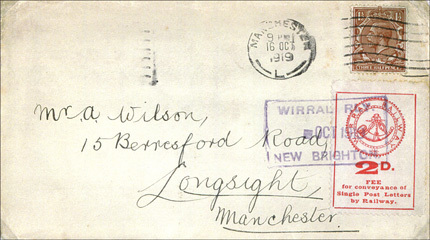 This letter was posted in October 1919 (the day digit is simply a square block, presumably an error in the setting up of the cancellation stamp). You will notice that the Wirral Railway 2d letter stamp clearly does not conform with the Post Office design specification. 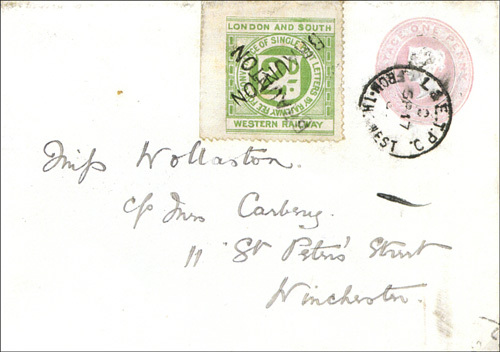 On 1 June 1920, the Post Office Inland Rate was increased to 2d, but once again there was a delay in the corresponding increase for railway letter stamps. 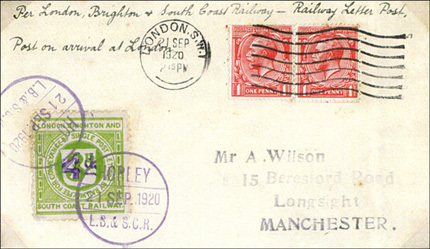 The rate for railway letter stamps was not increased to 4d until 1 September 1920. The letter below illustrates a fairly common practice followed by railway companies. 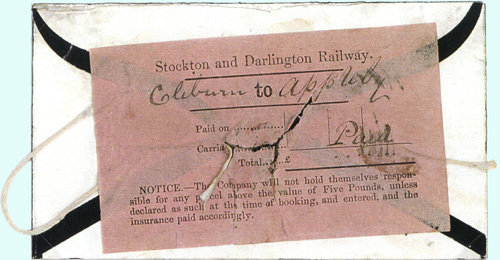 When the Post Office rate was increased, railway companies often still had considerable stocks of stamps at the ‘old’ rate. Rather than wastefully throw out this old stock, they often used them up by overprint the old value with the new value. 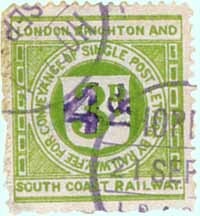 The above letter was posted on 21 September 1920, and the 3d London Brighton and South Coast Railway stamp used has been overprinted 4d in mauve ink.